Our product is 100% Natural Corn Gluten. 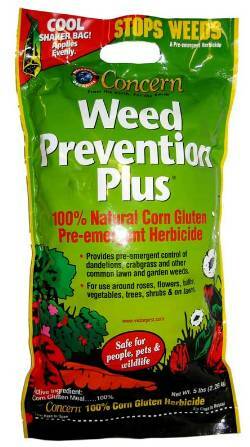 It is the most effective Natural preemergent on the market today. In 1986, the Iowa State University Research Foundation discovered that corn gluten had the ability to inhibit the germination of grass and weed seeds in their test plots. It worked so well that our formulation has 2 patents from the United States Patent Office. When our Corn Gluten is finished working to stop your weeds, it breaks down into nitrogen and naturally fertilizes your trees, shrubs and lawn. Safe for the environment and safe for your kids. What else could you ask for? Some people have even told us it kills ants .... safely and naturally. 5lb bag covers upto 250 sq ft. Lasts 4 to 6 weeks. From Anonymous of Bakersfield, California on 6/3/2008 .